December 2015 – The Rockin' WAVES 11294 Radio Network! 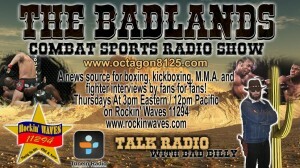 The Badlands Combat Sports Radio Show RETURNS! The Badlands Combat Sports Radio Show first started on the Philmore Productions Voicemail system on October 27, 2008 and was available at +1 (773) 572-7878. I would have a guest on the show as we would talk about current events in boxing, kickboxing, M.M.A., and all other unarmed hand-to-hand combat sports. At that time the show was titled The Octagon. On July 24, 2009 the show moved to My TeleSpace. On September 23, 2011 the show expanded to Blog Talk Radio as an internet podcast as well as being heard by calling the telephone hotline. 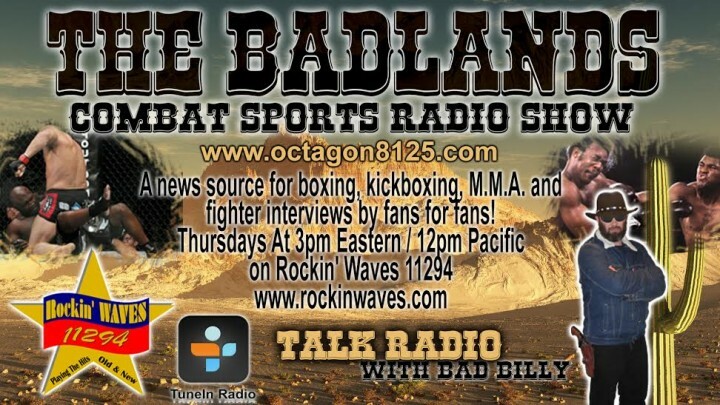 On December 20, 2013 the name of the show was changed from the Octagon to the Badlands Combat Sports Radio Show. In 2015 I enrolled with American Broadcasting. After continuously having problems with Blog Talk Radio, I decided to no longer broadcast with them. I also decided that after seven years of running the show, I needed a break and took a hiatus for two months. I’m returning on Thursday, December 3, 2015 and the show can be heard on Rockin’ WAVES 11294 (www.rockinwaves.com) every Thursday at 3:00 PM Eastern/12:00 PM (live broadcast times my change). You can easily access Rockin’ WAVES on your smart phone or tablet with the TuneIn app. You can also hear archived shows by going to www.mixcloud.com/aow_productions or by calling +1 (832) 999-8125. My official website is still www.octagon8125.com and you can expect changes to come to that as well. Upcoming fighter interviews include Micol De Segni from Italy, U.F.C. veterans, Guy Mezger, Cal Worsham, and Patrick Smith, and much more. I’m excited to be back with this new platform. Thanks for listening. as told to Chris Master.